I suspect we waited for all three to deliver their paperwork, so it could be announced as a group. Which probably means no more signings this period. It's great to get our name out there. I'm still stoked about the future with KB. Thanks for spotting and sharing, OTF! Definitely nice to see UP getting some credit for recruiting. So, now that KB has been at UP for over 9 months (he attended summer school at UP), what is he thinking? 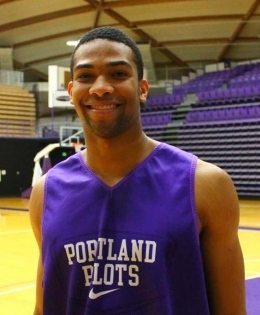 I met with freshman guard Kevin Bailey to talk to the school's first ESPN top 100 recruit about why he chose the University of Portland and how he would survive on a desert island. Q: Out of all the schools that recruited you, why did you choose UP? A: I didn't want to wait behind older guys. I wanted to make an impact when I came. They had a young team here, and I felt like they had all the pieces to do something special. Q: You are the first ESPN top 100 recruit to come to UP. Did you feel pressure to perform immediately? A: I knew I was going have it. It wasn't like it was new. I knew people were going to expect me to do big things, and I wanted to do that. Q: If you were stuck on an island with one teammate, who would it be and why? A: If I had to pick it would probably be one of the seniors. Probably Nem because I feel like he would know how to live on the island. If I took one of the freshman we would both die. He is older and wiser. I feel like he would know how to make food out of plants or how to fish. Q: Aside from playing basketball, what is your favorite thing to do in Portland or UP? A: I like to relax and hang out. There is close community here that I like. I like to go out and do a movie, have fun and hang out with other friends. Q: If you could have lunch with one person, who would it be and why? A: Kobe. I would want to pick his brain. I would be fascinated. If I wasn't too star struck I would ask him a million questions. Q: Not having the most successful year, what should Pilot fans be looking forward to next season? A: Just tons of improvement. The fans understand how young we are. Coming in, I am trying to make a big impact. Tim (Douglas) and other starters were still trying to figure it out. Nem and Eric had to figure out how to play with us. Next year we have a young group coming up and we're going to be so much better. Q: If you had to move to a state or country besides the one you currently live in, where would you move and why? A: The warmest place. Always wanted to be in Australia. I love warm weather. Q: You're dating teammate Riley Barker's sister, was there an arm wrestling contest or something of that nature involved in order to receive approval from big bro? A: I guess. He wouldn't let me until we got a win so I guess I can thank Santa Clara for that. Q: Who is your favorite NBA player and why? A: Kobe. I'm with the Kobe system. I think he is the greatest. His game is smooth and he has no fear. I think Kobe is better than Jordan. People who have lived through Jordan era saw young MJ but I watched old Jordan. I watched Kobe growing up and I'm definitely in the Kobe system. Q: What is in your opinion the best basketball shoe and why? A: Nike Hyperdunk. I haven't tried the D-Rose, and I heard they're lighter. But the Hyperdunks are lightest shoes I have ever had. You feel like there is no weight on you. I didn't realize that Jhonny Dee of SD had been a walk on until watching the half time. a interviewrevealed that fact. Unless I am mistaken he red shirted last year and went on scholarship this year. How on the world did everybody miss him? I'm pretty sure Kevin wasn't ESPN Top 100. He made a different top 100 list but not ESPN's. ShipstadPilot11 wrote: I'm pretty sure Kevin wasn't ESPN Top 100. He made a different top 100 list but not ESPN's. Hoop scoop top 100, rivals top 150, and ESPN 3 star. All of those are better than anybody since I have been watching the Pilots. I don't doubt it. And Kevin has backed up the accolades with his play! The University has used the 'Top 100' phrase a lot and people assume ESPN (incorrectly). Bruce probably should have known that and I'm sure Kevin opted not to correct him. A nice interview, though! I'm continually excited for the future of this program, starting Saturday at Pepp. Nice to read. You always worry about dissension and internal conflict when a team is losing a lot, but I don't sense it. I think Riley and Kevin are going to be excellent players next year (knock on wood for Riley's knee). Received an email earlier today from a former UP player now living in Europe telling me that KB has signed with Polpharma Starogard Gdansk in Poland. I checked the roster and the "news wires," but there is no mention of Kevin...so maybe this is a scoop! It was on the UP twitters yesterday. OK, now KB has been added to the roster....along with another American player directly out of NCAA D1. I can't recall all the rules for "foreign" players on a team in Euro Basketball, but Polpharma Starogard Gdanski now has five US players. DoubleDipper wrote: OK, now KB has been added to the roster....along with another American player directly out of NCAA D1. The answer is that it varies from league to league. Some leagues, like the one Ryan is playing in, has a 2 import limit while others like Poland and the German BBL has a maximum of 6. Those limits are getting harder to enforce with EU employment laws against discriminating against citizens of other EU countries under the EU's "single market" concept. In soccer, it has become almost impossible to enforce in the top leagues. Lesser leagues are given some slack if their focus is development.